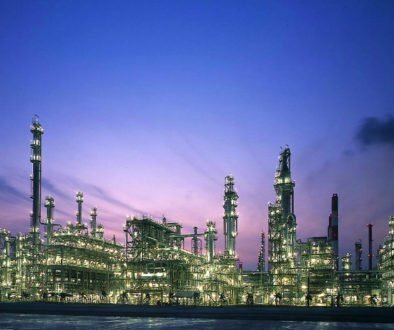 Centrifugal pumps, both single and multi stage, are the most common type of pumps used in petro-chemical plant. The fluid usually enters along the axis or center, is accelerated by the rotating impeller and exits at right angles to the shaft. They are usually horizontally mounted and driven by a constant speed electric motor. But they can be vertical, submerged or driven by a variable speed motor or turbine. 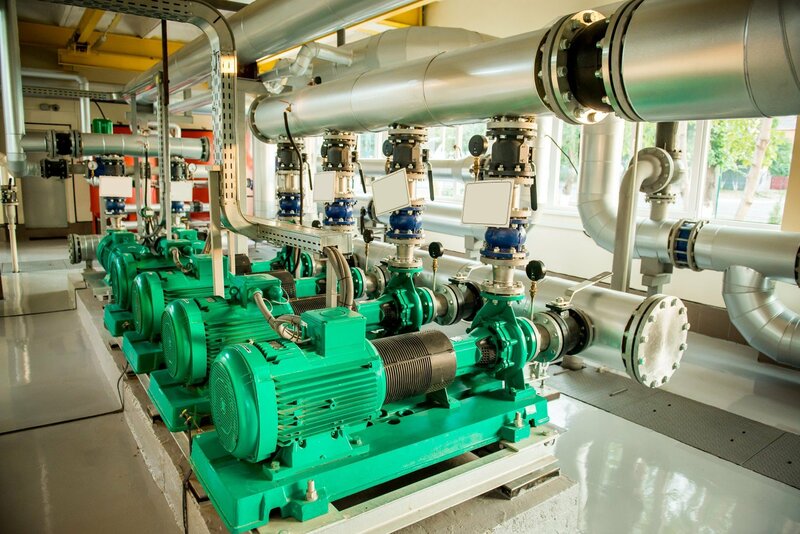 They are often used in groups of 2 or more identical pumps in a single process service, often with a permanent spare pump to be brought online when one of the group is isolated and down for service. The suction and discharge manifolds are sized to carry the full pumping volume of all the related pumps. The smaller piping to and from each pump and the manifold must be designed to be symmetrical and without high points or low point pockets. The nozzles on pumps are referred to as the suction and discharge. While discharge is an accurate description of the nozzles function, suction is not. Centrifugal pumps cannot create suction, they must have a minimum pressure or head of liquid at the inlet (suction) nozzle. As the impeller of the pump rotates it creates a low pressure area behind its trailing edge, depending on the vapor pressure of the liquid being pumped if the suction head pressure is too low the liquid will flash or boil behind the impeller. This causes vibration and wear of the impeller and is known as cavitation. The process engineer must calculate the minimum height or head of liquid that must be maintained at the pump inlet to prevent cavitation. This calculation must take into account the specific liquid vapor pressure, the height of low liquid level of the vessel being pumped and the pressure loses due to friction in the pump inlet piping. The calculation will result in the net positive suction head required ( NPSH) for each pump or group of pumps. 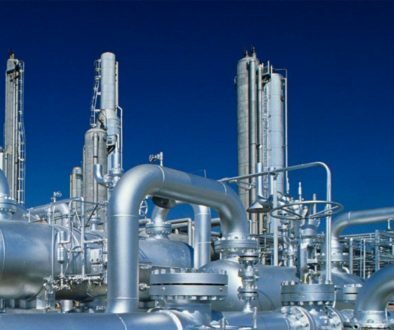 The process engineer must indicate, on the P&ID, the minimum height above nominal grade, or the pump location, that the vessel bottom or tangent line must be to ensure that the NPSH is achieved. The piping designer must elevate the vessel to at least this height by means of saddles, support structure or vessel skirt. Suction and discharge nozzles are typically smaller than their connecting piping due to manufacturers supplying pump casings for a range of duties with varying motor sizes. Reducers will therefore be required as close to the nozzle flanges as possible. The suction nozzle reducer should always be eccentric and be oriented top flat, if concentric or bottom flat reducers are used then air pockets can form on top of the suction piping and be drawn into the pump causing cavitation. There are many opinions about if or when bottom flat suction reducers should be used. I have never heard a convincing argument for a concentric or bottom flat eccentric suction reducer regardless of the type of fluid or service of the pump, the only consideration is eradication of air in the top part of the horizontal suction piping. However the discharge nozzle can be concentric and vertical and bottom flat eccentrics can be used on horizontal discharges if required for drainage. The suction and discharge reducers create natural flanged spools between the pumps and their isolating valves. The suction spool will contain the temporary strainer which must be removed after start up. 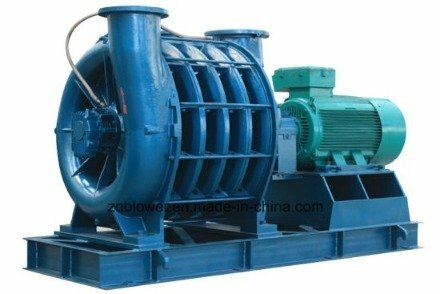 The discharge spool must be removed before the pump can be lifted and removed for maintenance. In the rare instance of suction or discharge piping being the same size as the nozzles always include straight spools on the suction and discharge nozzles between nozzle and first valve, do NOT be tempted to bolt the valves directly to the nozzles and eliminate these removable spools as it will compromise pump maintenance and removal. Most, but not all, single stage pumps are arranged with their suction nozzle facing front and discharge nozzle facing up. 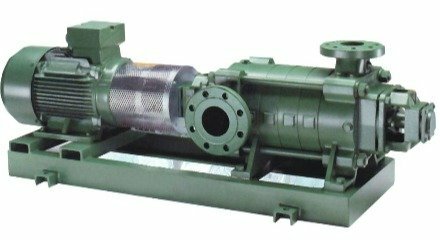 Single stage centrifugal pumps with suction and discharge nozzles facing each side are known as horizontal split casing pumps. The Casing is split to allow easier removal of the impeller. All multi stage pumps have a side suction nozzle with an up or side facing discharge nozzle. Nozzles on all types of rotating equipment are particularly sensitive to overloading and stress. It is not that they are weak, but rather that stress can be transferred through the casing to other components such as bearings and mechanical seals and cause premature failure. For this reason piping flexibility and pipe supporting is critical in this area. The stress engineer will have the allowable loads that each nozzle can accept and after checking the layout for adequate flexibility, instruct the designer to place base supports on the suction and maybe the discharge piping close to the pump to minimize the nozzle loadings. What the stress engineer might not do is to request that these base supports be adjustable. 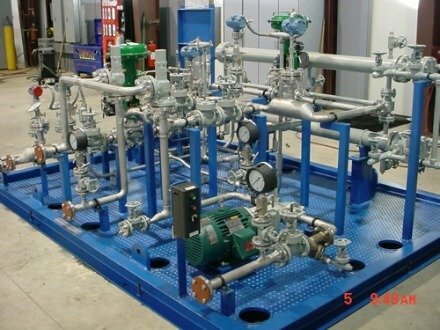 Adjustable base supports are required because after the initial installation and commissioning of the pumps and their piping small amounts of civil and mechanical ‘settlement’ take place. If the piping or pumps are removed during a shut down it may be found that there is some misalignment between the pump and it’s piping during re-assembly. Uncorrected misalignments of only fractions of an inch can cause the nozzle to become over stressed. If the supports are rigid no adjustment can be made to correct this misalignment. They must be adjustable, that decision is often made by the designer. Pumps are fairly high maintenance equipment so their layout and accessibility is critical. Pumps are also one of the most common sources of fire due to ruptured pump seals. In the past common practice was that all pumps were placed under pipe racks which gave great accessibility for maintenance. 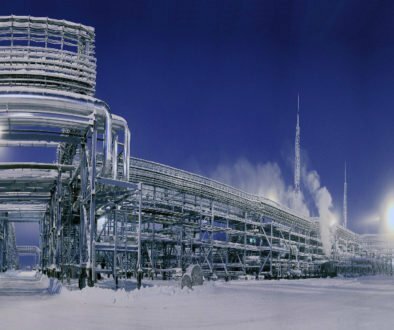 This practice was discontinued in the 1970’s after many refinery fires where the whole pipe rack and aerial coolers above it collapsed after seal rupture fires originated in the pump row beneath. Modern plant layouts place the pump row outside but adjacent to the pipe rack, motors in, pumps out. Always allow at least 1 meter between pump bases. This will need to be increased with the straight diameter requirements of side suction pumps. After the vertical reducer spool on top discharge pumps consider placing an elbow and running the check valve horizontal before turning back vertical to the isolating valve. This allows a base support under the second elbow to reduce nozzle load and lowers the isolating valve for operation, but this will also require wider pump spacing. Never run piping or allow cable tray to be run directly over the pump, this will eliminate any access to lift the pump or its motor. Reciprocating pumps move the fluid using one or more oscillating pistons, plungers, or diaphragms, while valves restrict fluid motion to the desired direction. In order for suction to take place, the pump must first pull the plunger in an outward motion to decrease pressure in the chamber. Once the plunger pushes back it will increase the pressure chamber and the inward pressure of the plunger will then open the discharge valve and release the fluid into the delivery pipe at a high velocity. 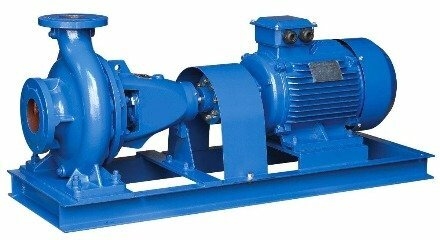 These pumps are usually used on very viscous and erosive fluids or slurries which would cause unacceptable wear on centrifugal pump impellers. They do not have the NPSH requirements of centrifugal pumps. As they release the fluid in high velocity “slugs” they are usually are equipped with pneumatic suction and discharge dampeners to attempt to even out the flow. These dampeners are usually provided by the manufacturer and are mounted on the piping near the pump inlet and outlet. They consist of a vertical cylinder with an air filled bladder inside. The release of the fluid is cyclic and just like reciprocating compressors the discharge piping is subject to vibration and must be firmly “held down” local to the pump. 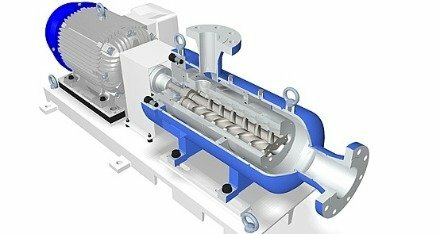 Rotary positive displacement pumps are even less common than reciprocating but are used in similar services. 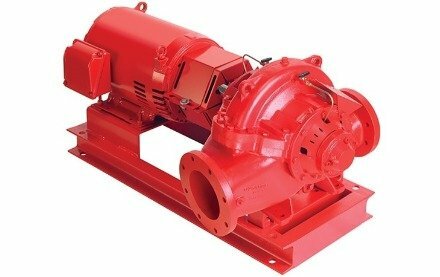 They have the advantage of continuous non vibrating flow but the nature of these pumps requires very close clearances between the rotating impeller or gear and the inner wall of the casing, making it rotate at a slow, steady speed. If rotary pumps are operated at high speeds, the fluids cause erosion, which eventually causes enlarged clearances that liquid can pass through, which reduces efficiency..
*In pipeline pumping stations multiple pumps are usually connected in series i.e, the discharge of one pump is connected to the suction of the next and each pump must be designed to supply the total fluid volume required. The total head required is the sum of the head of all the pumps. This due to the fact that the pipeline distances are much longer than plant piping and therefore the head is far greater. As the volumes are also greater pipeline pumps are also much larger. 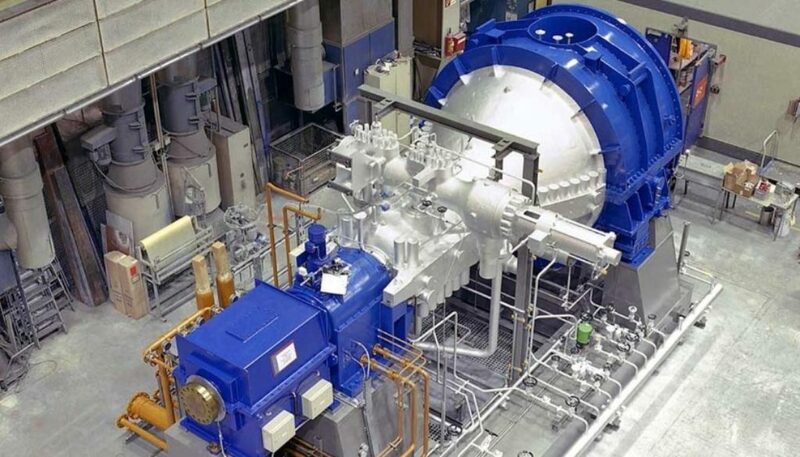 Centrifugal Compressors & Gas* Turbines are mechanically similar; they both contain a series or stages of rotary vanes connected to a shaft. The turbine is a driver, the compressor is driven. In a gas turbine the gas or superheated steam (considered to be a dry gas) enters the inlet nozzle at high pressure, it expands as it passes through and rotates the vanes which rotate the drive shaft. It then exits the outlet nozzle as a low pressure gas or LP steam. In a compressor it is the reverse. The gas enters the inlet nozzle at low pressure, it is compressed as it passes through the vanes which are rotated by the driven shaft (sometimes turbine driven **) and exits the outlet as high pressure gas. Due to the high degree of engineering integrity and close mechanical tolerances of gas turbine and compressor internals the protection of those internals is even more critical than that of pumps. The nozzle loadings are usually governed by the National Electrical Manufactures Association (NEMA) this is due to the fact that most large turbines are the drivers of large electrical generators. These fairly conservative allowable nozzle loadings make the coordination between the piping designer and the stress engineer critical, particularly when it comes to the inlet nozzle of HP steam turbines. The combination of high temperatures, expansion movement and low allowable inlet nozzle loads is particularly challenging for both designer and engineer. A general rule is to try and change the HP steam line routing direction in 3 planes immediately before the inlet nozzle trap. The rotating vanes of a gas turbine or compressor are also very vulnerable to damage from small solid or liquid particles in the inlet gas stream and requires filtration of the inlet gas usually in the form of an inlet gas scrubber. With the steam turbine the biggest threat is from high velocity condensate droplet carry over during warm up prior to start up. It is critical that the steam trap system before the inlet Trip & Throttle Valve (T&T) is properly designed. *The Gas turbine referred to here is a turbine driven by high pressure gas or superheat steam where the fluid expands through the turbine stages to rotate the vanes and shaft. It is not to be confused with the jet engine type where fuel is injected and ignited. The expanding hot gas rotates the vanes and shaft and drives the built in in-line centrifugal combustion air compressor. However this type of jet turbine is sometimes used as the driver for large centrifugal gas transmission pipeline compressors. Neither of these turbines is mechanically similar to the large water driven turbines used in the Hydroelectric generation industry. ** This turbine driven compressor arrangement is sometimes known a Turbo Expander in gas and refrigeration plants. The primary purpose of the Expander is to provide high gas pressure reduction but also provides drive to the compressor as a secondary function. 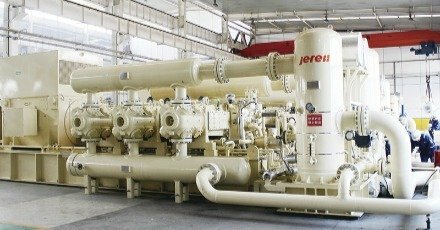 Reciprocating Process Gas Compressors (recip.) 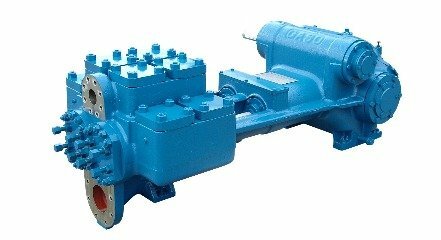 * are usually large horizontally opposed twin or multi cylinder, multi stage machines which, like positive displacement pumps but unlike centrifugal compressors, produce a pulsating flow. This flow pattern coupled with the fact that they often are used to compress heavier than air gases makes them one of the most common causes of plant explosion. To avoid this hazard the layout and piping design around reciprocating compressors is critical. From a layout point of view two points are critical. Firstly enclosing a recip inside a building significantly increases the explosion risk, it is much safer to place them in a shelter which has some open sides to ensure good ventilation. Secondly the temptation to run low level piping in open or closed trenches should be avoided, again because of the explosion risk due to heavier than air gases collecting at low points with poor or no ventilation. The reason for running all suction and discharge piping at low level is to “Hold Down” the piping subject to pulsating flow, these hold downs must be on a solid concrete surface not elevated steel structures. The hold down points are determined by the Analogue Study that must be commissioned on all large recip piping systems. This study is usually carried out by a specialist contractor and examines the interactions of the pulsation cycles and natural vibration frequencies and determines were the hold downs must be placed to minimise those interactions. Placing of the hold downs where required by the study is critical. Hold downs are usually included in the company pipe support standards and consist of special clamps designed to limit vertical piping movement while allowing lateral movement. The Analogue Study will cover the whole piping system from the suction scrubber outlet to the discharge scrubber inlet as a minimum, but often it will go far beyond the discharge scrubber. A scrubber is more accurately described as a vapor-liquid separator and is usually a vertical vessel. They are required to prevent liquid entering and damaging the recip and from forming liquid slugs in the discharge piping. It is important not to pocket the piping between the scrubbers and the compressor more than absolutely necessary as a liquid slug forming in any part of the suction or discharge piping can cause catastrophic damage. *Instrument and Utility Air compressors are also usually reciprocating but are much smaller that the compressors above and are usually supplied in an enclosed vendor package. All compressors and turbines require a Lubrication (Lube) Oil system. This is usually provided by the equipment vendor and consists of tanks, pumps filters and coolers. In the case of a large recip the Lube Oil system will be extensive and usually be mounted on its own skid or module. As this module will have been designed by the equipment vendor care should be taken in checking the vendor’s layout drawings to ensure it meets the clients access and maintenance standards. 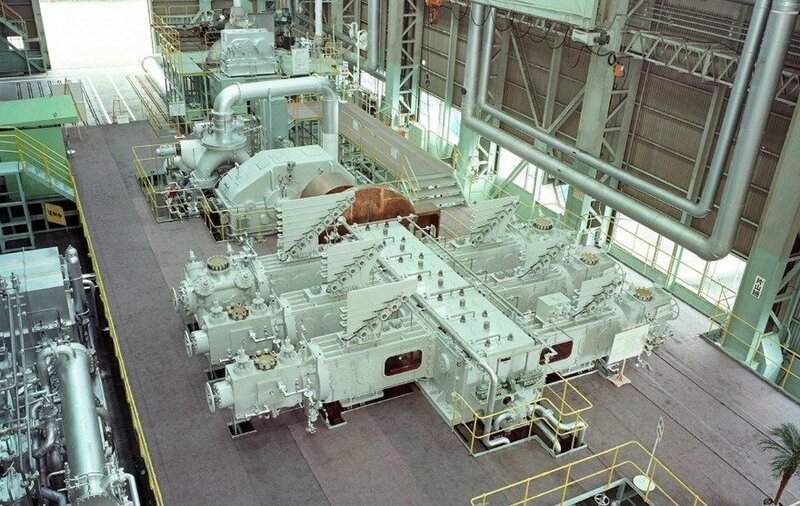 Most large centrifugal compressors and turbines require a dedicated overhead crane for maintenance. In the case of reciprocating compressors this is mandatory. The cylinders, pistons and suction / discharge bottles are very heavy and require the designer to allow adequate space for removal and lifting over the main crankshaft casing. 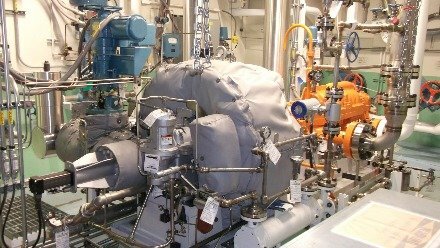 As with pumps, running any piping or cable tray directly above a compressor or turbine will seriously compromise maintenance of the equipment.